The sale of tobacco should be regulated to achieve the goal of controlling non-communicable diseases in India, said Union Health Minister Harsh Vardhan here Thursday. "It makes perfect economic sense to regulate the use of tobacco in order to achieve the goal of controlling non-communicable disease in India. 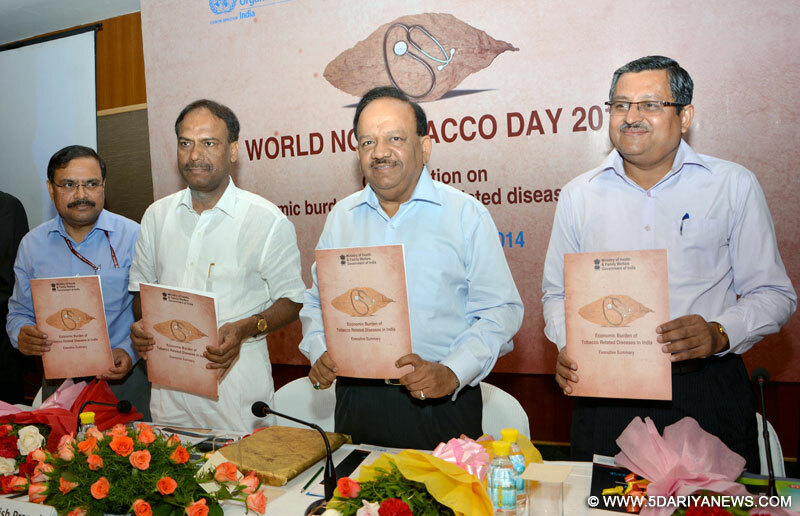 Tobacco use is a preventable risk factor for major diseases and the resultant economic consequences," Harsh Vardhan said, releasing a report on the economic burden of tobacco in India.He said: "I firmly believe that unless all of us come together and fight back tobacco resolutely, the financial burden of tobacco-attributable diseases will continue to push the families of millions of tobacco users towards poverty and steadily decelerate the economic growth of the country. We cannot and must not let that happen." The union health minister released the highlights of the report on the "Economic Burden of Tobacco Related Diseases in India".The report, supported by the health ministry and the World Health Organization (WHO), was developed by the Public Health Foundation of India.It estimates the direct and indirect costs from all diseases caused due to tobacco use and, specifically, the costs of respiratory diseases, tuberculosis, cardiovascular diseases and cancers.The report highlights that tobacco use and the associated costs are creating an enormous burden on the nation. Nata Menabde, WHO representative in India, said: "The evidence couldn't be more clear and stark. It is, therefore, imperative that we seize the moment. Raising taxes is one of our strongest weapons to fight out tobacco and this is what the WHO Framework Convention on Tobacco Control mandates. ""A tax increase that raises prices of tobacco products by 10 percent is estimated to reduce tobacco consumption by four to five percent. Essentially, as the tax goes up, death and disease go down. Raising taxes on tobacco is a win-win situation. It is good for people's health and good for the economy," she added.